Shannon Parks, owner of DIYTube, has made a number of projects available since 2003 when the DIYTube ST35 clone was made available. DIYTube is both Shannon's small business located in central Illinois and a close-knit forum featuring a handful of helpful and prolific members. 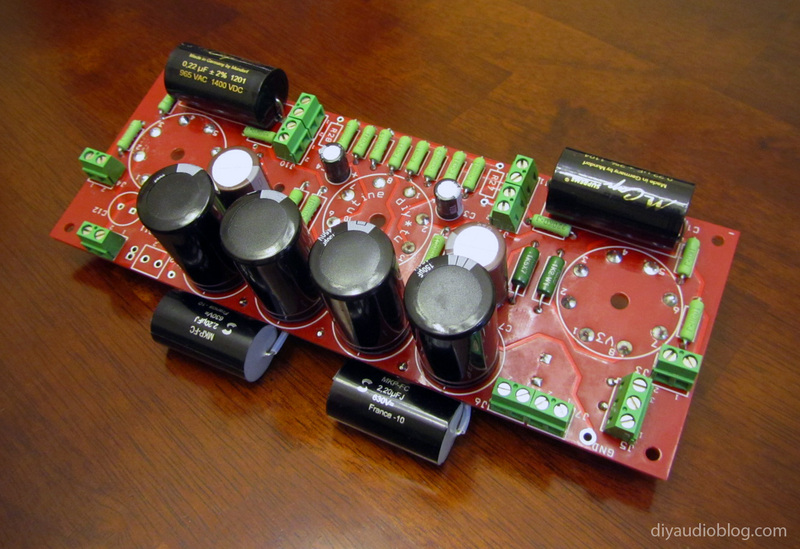 Projects on DIYTube include the 60 watt Eiclone amplifier to driver boards for Dynacos to stand-alone single-ended amplifiers like the Clementine and Get Set Go. The projects are all well documented and feature circuit boards for easy building. 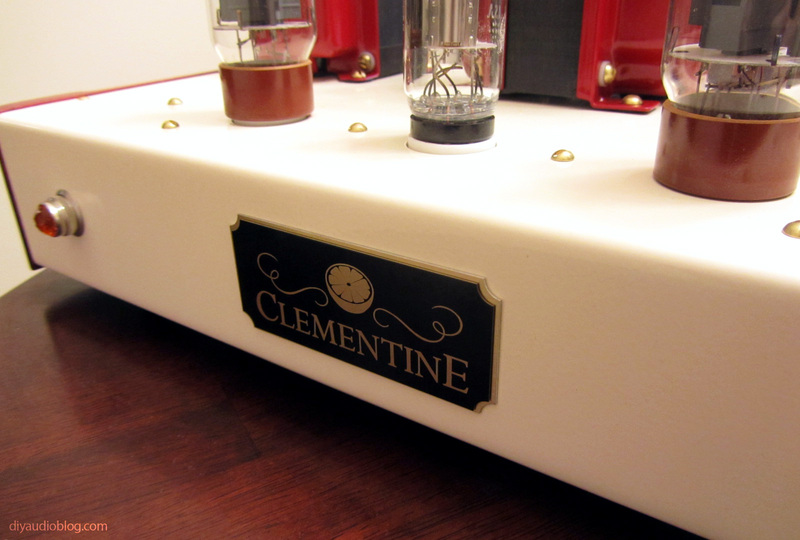 The Clementine can be configured to use with 1626 Darling tubes (hence the cute name... oh my darling Clementine) to output 3/4 of a watt or with 6L6 tubes (equivalents: 6L6GC / 807 / 1625 / 6BG6) for a fruitful yield of 5 watts (see what I did there?). 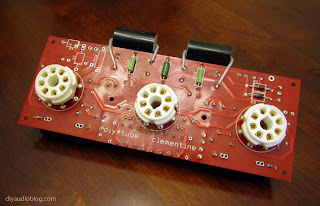 This post is dedicated to the building of the 6L6 Clementine. 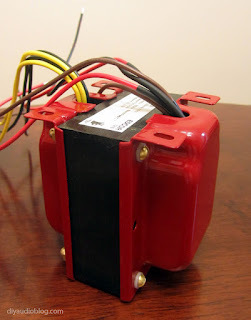 The transformers used for this build aren't quite as fancy as the Transcendars found in the Get*Set*Go build, these would be the tried and true Edcor XPWR005-120 power and GXSE15-8-5K outputs. If you aren't familiar with Edcor, they're likely one of the best-value transformer manufacturers in the U.S. 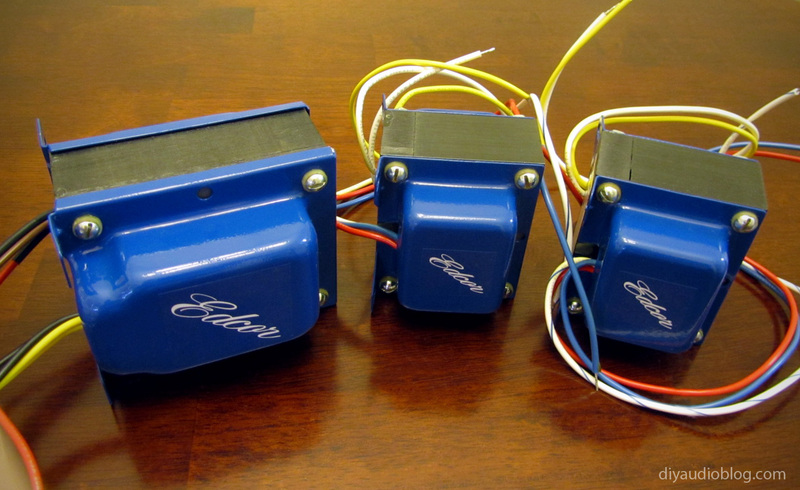 They've been around since 1971 and have been offering distinctive "True Blue" transformers to hobbyists for decades. All of their transformers are made-to-order, so there's usually a 4-6 week waiting period before you get your order, which really isn't so bad considering their pricing. Important to note is the 8 pin sockets need to be carefully lined up before and during soldering. 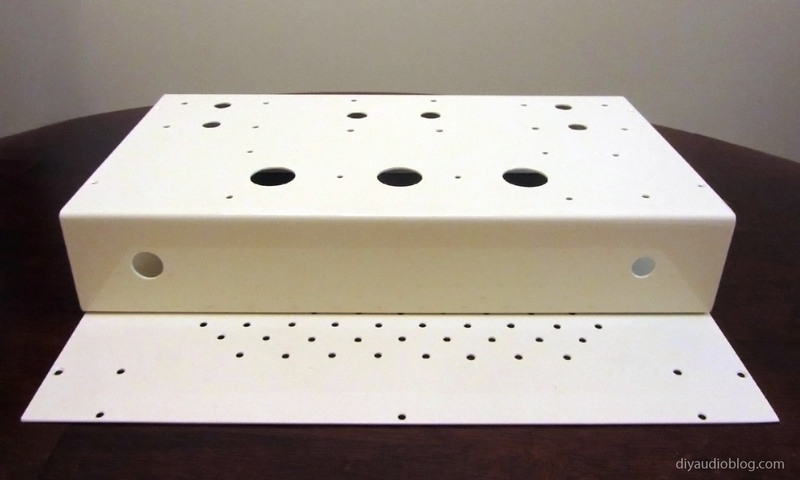 It's possible to end up with them at a slight angle, which will cause the tubes to jut out at an angle on the top of the chassis. 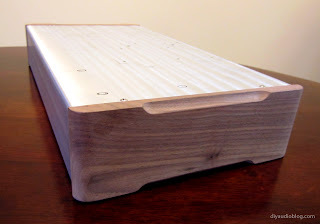 With a bit of heating the joints and shifting, I was able to get them nice and parallel with the board. Once everything was placed, a nice scrub-down with a toothbrush and rubbing alcohol was in order to get all the rosin flux off the board. For the chassis, Keith (po1019 on Ebay) fabricated me a very nice one made from aluminum and walnut side panels. 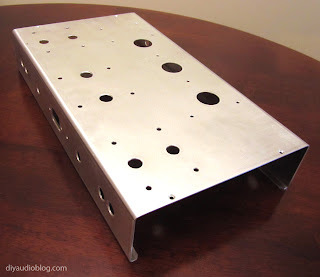 Keith's work is very professional and I hope to continue using his chassis for my future endeavors. One of the more time consuming parts of a build is creating all the necessary holes in the chassis using a combination of the drill press, Greenlee die punches for the tube holes and a Dremel cutting disc for the IEC inlet. 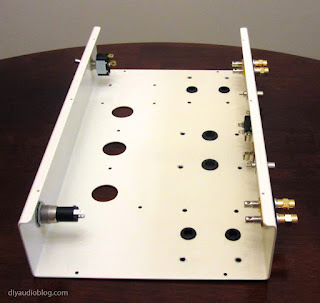 Below is the chassis ready to head over to the powdercoater. The chassis was then powdercoated a nice cream color. ...and the transformer bells a dark red. The transformers also got some brand new nylon screw insulators and brass hardware. I'm not sure why, but often times the nylon insulators that come with transformers are worn looking and discolored. This process is a decent amount of work. The original hardware has to be removed, the bells sanded and taken to the powdercoater, the nylon insulators squeezed into place, then the brass screws trimmed down to fit, then the acorn nuts tightened in place, all for the sake of presentation. The next task is to add some rubber grommets to the chassis where the wire from the transformers runs inside. This is to protect the wire from rubbing up against a potentially sharp edge on the hole and shorting to the chassis metal. It's an added precaution for the sake of safety. The next process was to add the switch, pilot light, power inlet, signal input RCAs and output binding posts. The RCAs are Cardas GRFA, the binding posts are Cardas Economy ACBP, which are still on the pricey side in my humble opinion but not as much as the CCBP copper posts I typically use. Nearly all these items are installed with a socket wrench. The PCB and choke were then installed. The PCB was installed using standoffs, screws and lockwashers to prevent anything from coming loose down the line. 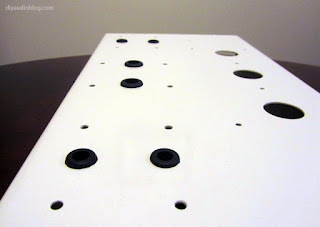 The choke was installed using rubber washers underneath to damp any vibrations from making their way to the chassis, along with size #6 hardware. Next the Edcor transformers can be installed. Only two were added at this point as one of the bells was a little shy on the paint from the powdercoater and it needed a respray. The transformers also get rubber washers underneath, along with size #8 hardware, including lock washer, washer, nut and screw. The Edcors were wired into place. 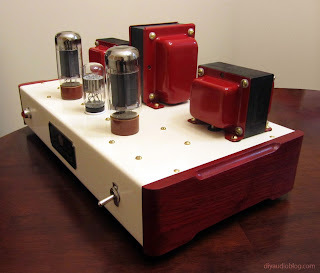 I've seen a number of members double up the 6.3V taps in order to use other tubes, but for this particular build I only plan on using 6L6s so I won't be performing that mod. 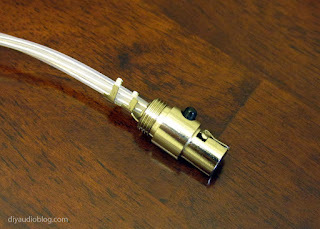 The extra 6.3V tap (brown) will be dedicated to the pilot light. The power wiring and front switch was also wired up during this step. Directly after the fuse is a GE Thermistor wired on solder tabs (the little black circle in the middle of the photo below). A thermistor is a resistor which has a resistance that varies depending on temperature. 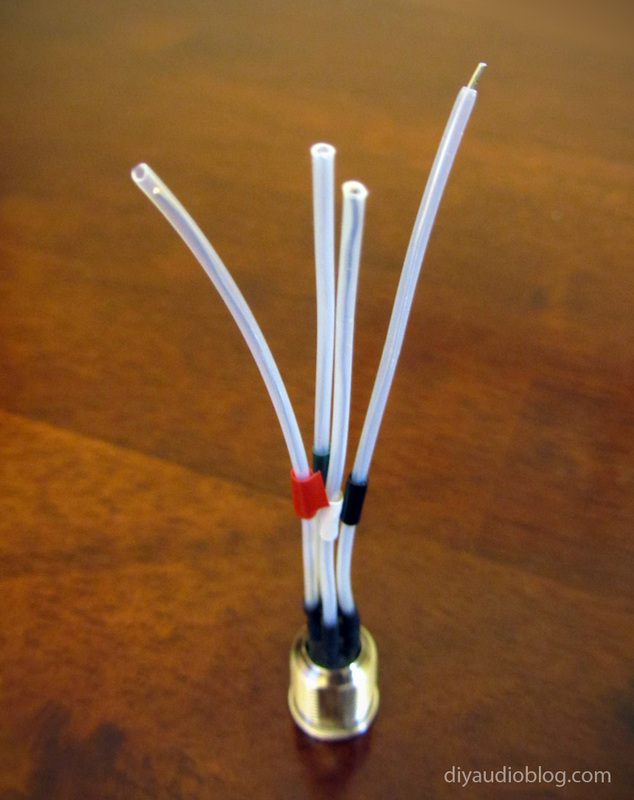 In this case, the NTC thermistor is used for inrush-current limiting. 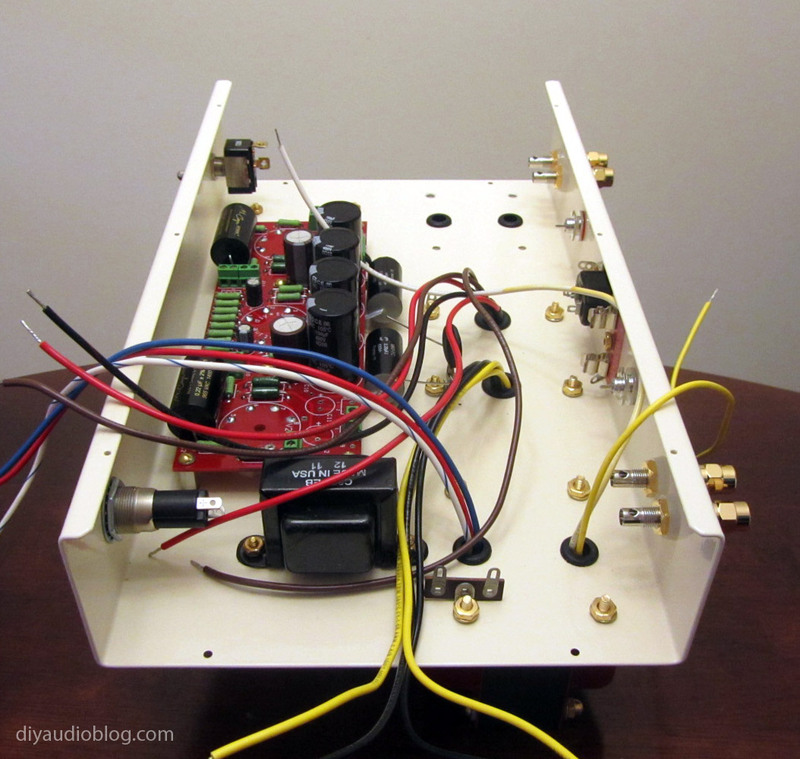 A higher resistance is provided initially which prevents large currents right after turning the amp on. Once it has heated up, the resistance is much lower, allowing higher current flow. UPDATE: After a lengthy delay waiting to get the transformer bells resprayed, I've finally finished up this wonderful little amp. 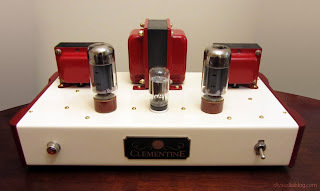 I used a pair of Svetlana 6L6 tubes and a NOS coin-base 6SL7. The Clementine sounds like a champ, surprisingly resolving. 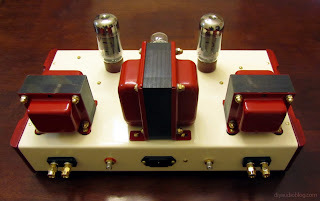 For my personal tastes, I like to run it with a subwoofer to get some additional bottom-end extension. Below is the detail of my custom designed and engraved Clementine logo with clipped cornes on a brass plate. This logo was designed in Illustrator (vector) and sent to a trophy maker for engraving. I hope you enjoyed this build. 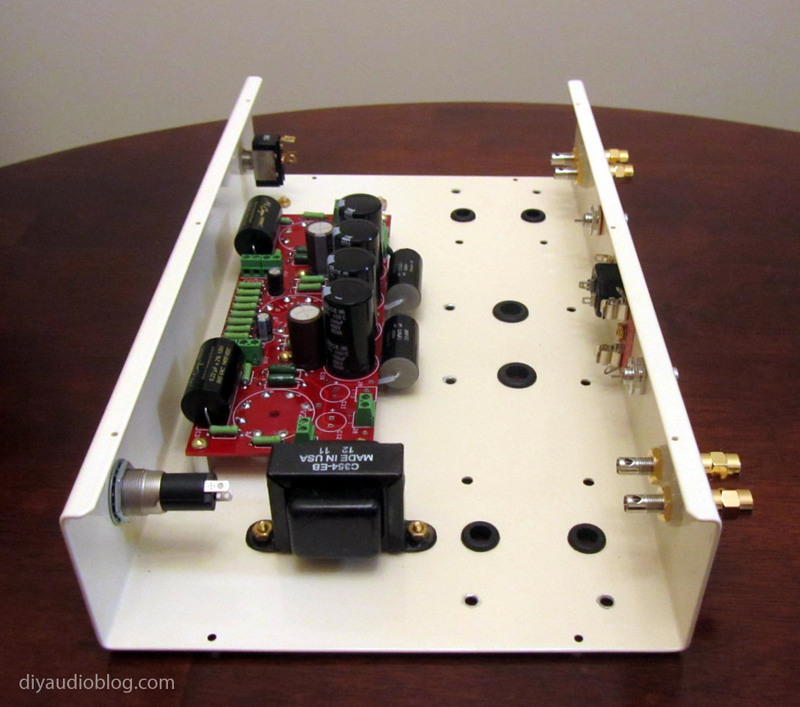 I highly recommend checking out Shannon Park's offerings at DIYTube and Parks Audio. Also be sure to check out my matching Get Set Go amplifier. 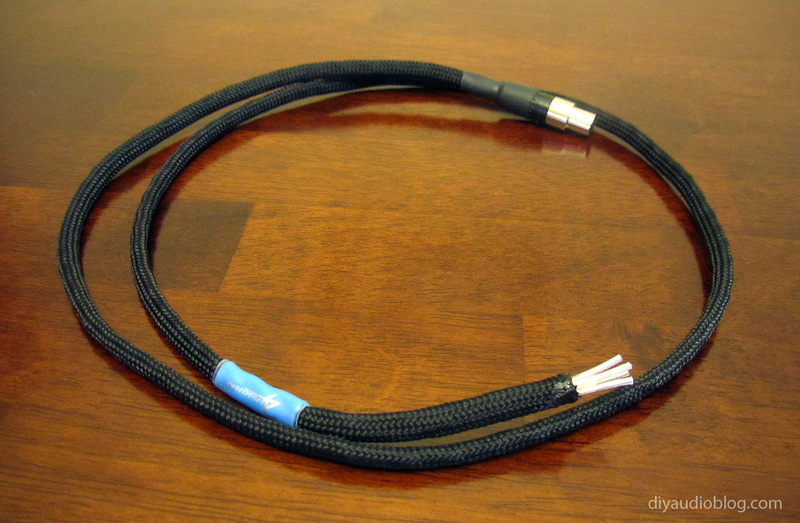 Need a custom audio cable to take your rig's sound to the next level? 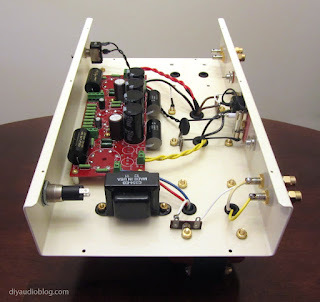 Contact Zynsonix Audio for smart solutions. 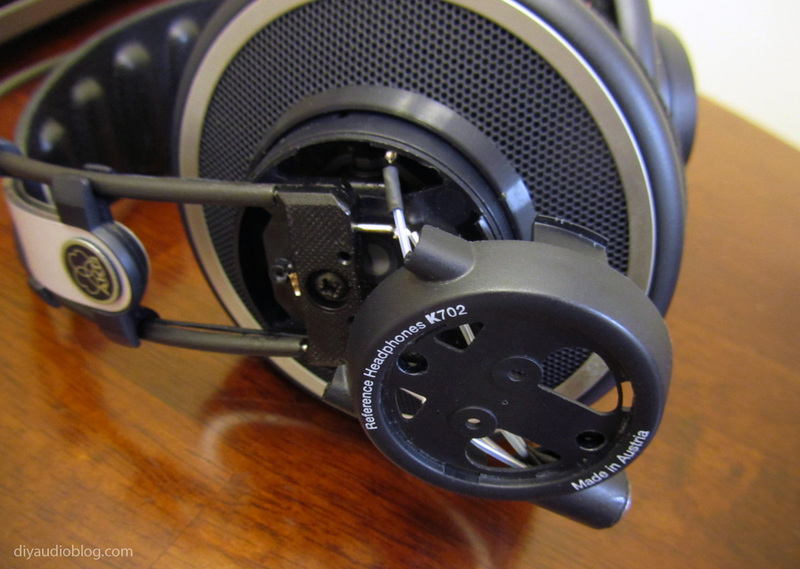 The AKG K702 headphone is quite simply a black AKG K701 heaphone with a removable mini 3 pin cable. It's very nice to be able to remove the cable from a headphone with the click of a button, which is where the 3 pin mini-XLR comes into play. Switchcraft is well known for these connectors and offers them in a number of different pin configurations. Clicking the little black button on these connectors allows them to disconnect from the jack, so if a user runs over their cable with the wheel of a chair, desires a shorter or longer cable, or wants a cable of higher quality, it's very easy to swap a new cable in. Zynsonix offers replacement cables for the K702 among other headphones with removable cables if one is in the market. With the existing 3 pin connector in the AKG K702, the two grounds for each channel are commonly connected. 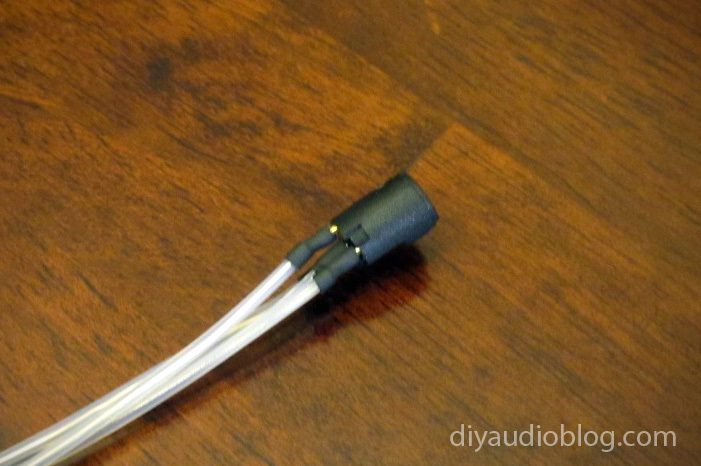 This won't work for a balanced connection to a balanced headphone amplifier where the grounds are run separately, so the existing three pin connector will be removed in favor of a 4 pin mini-XLR from Switchcraft. In this post, a pair of K702s will be getting repaired with some high quality Eys 99.999% pure silver wiring (5Ns) in PTFE tubing. This particular pair of K702s had the previous jack accidentally ripped out (perhaps the headbanging got a bit too frenetic ;) ), but luckily everything inside is still in good working order. (I've found that with other AKGs, getting the existing jack out can be quite tricky, requiring a Dremel tool and quite a bit of patience). One will notice in the photo below, the white wire is the ground, in which both the left and right ground are commonly connected. In order to get inside the plastic shell, the grill needs to be rotated using a pair of jewelers screwdrivers, then two small screws are removed from underneath the grill. The first task would be to wire up the Switchcraft 4-pin mini XLR jack with silver wire, this would be replacing the existing wire within the headphone. Each piece was made a little longer than necessary and color coded for easy reference with electrical tape. 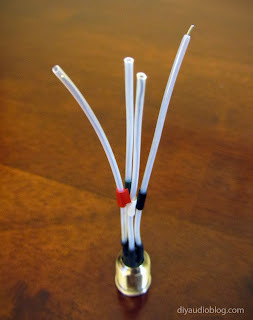 The solder joints were covered with very small diameter heatshrink tubing to prevent the Teflon tubing from moving while the jack was being installed. Now the jack could be slipped inside of the existing plastic shell. 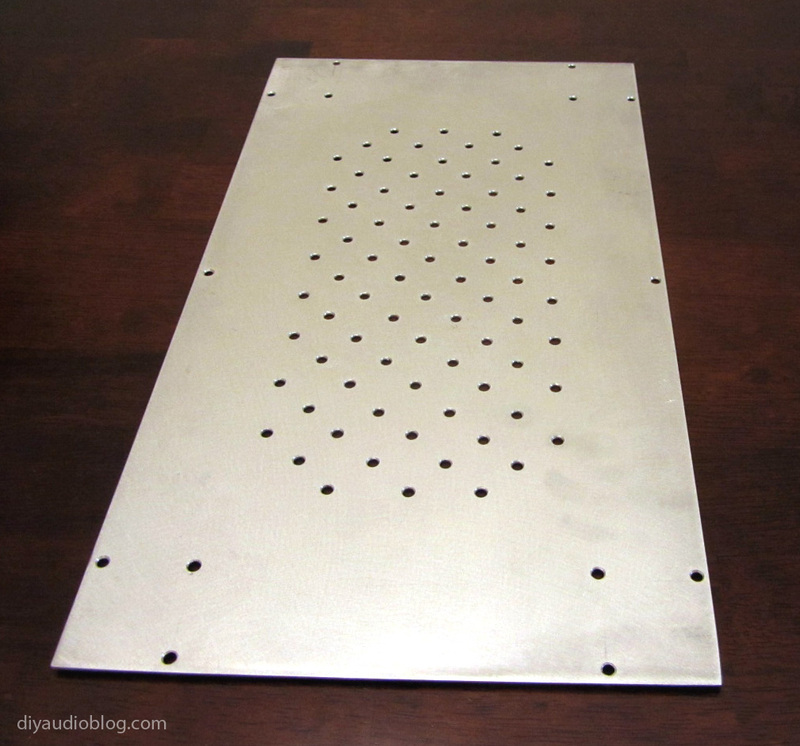 No dremeling or filing necessary is necessary when using a genuine Switchcraft jack. A strong adhesive does need to be used to keep the jack in place however. The stock wiring was removed at this point, a desoldering pump used to get off excess solder, and the new wires soldered in place. 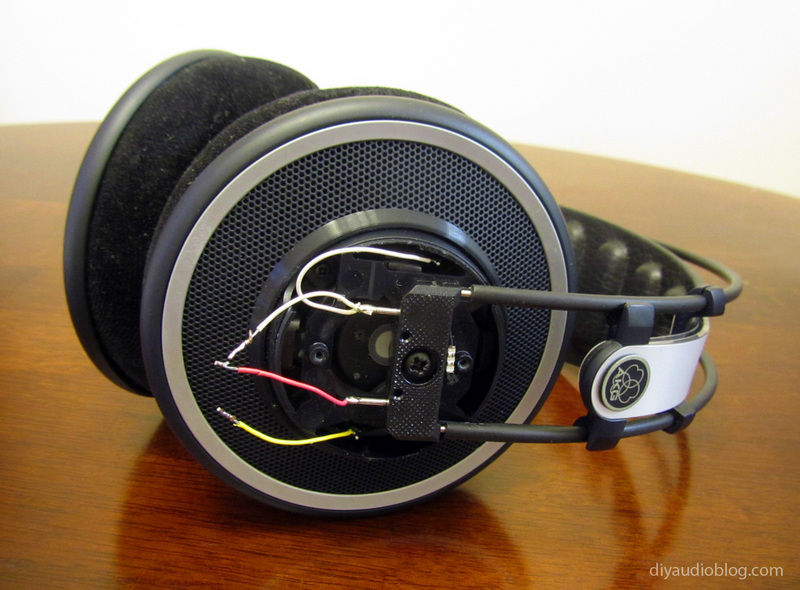 The solder points for the left driver are at the left-most and right-most points, and the solder points for the right driver travel along the headphone band, which are both closer to the center. Silver wiring was wired to the to the terminals and the plastic shell and grill were reinstalled. 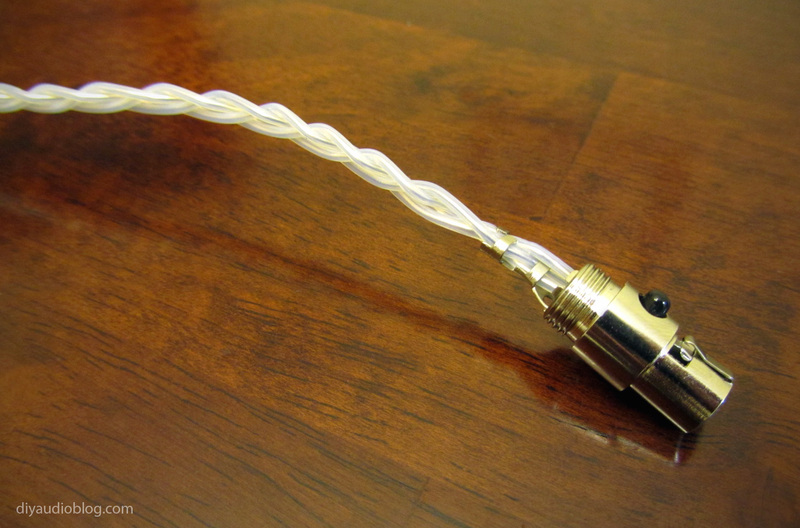 At this point, the matching silver cable could be built. Starting with a 4 pin mini XLR plug, the silver wires were soldered in place and small diameter heatshrink tubing was placed over the joints to prevent slippage of the Teflon tubing. 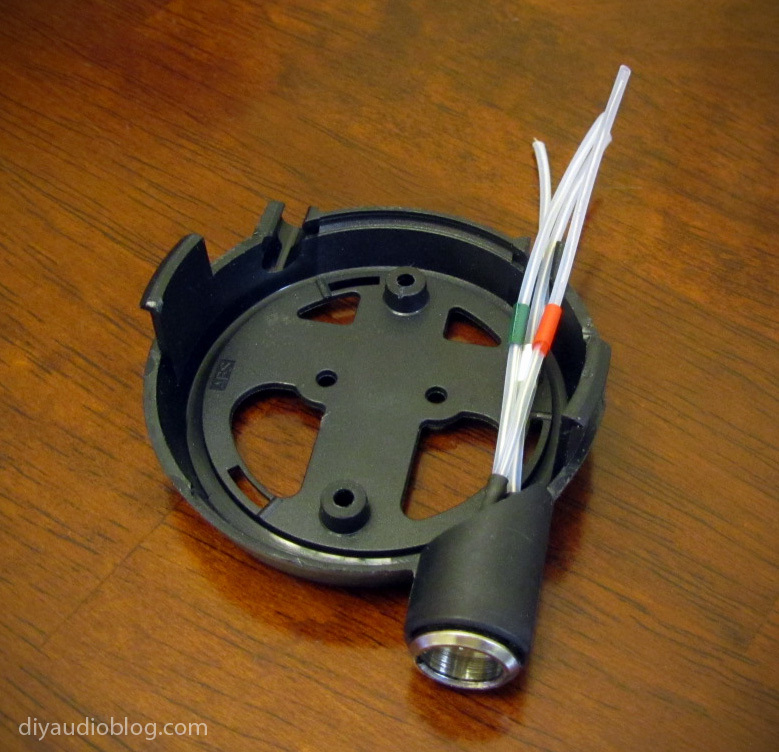 The metal jack barrel was then slipped in place over the plastic piece housing the contacts. The wires were then braided in a litz formation and the strain relief clamped down on the wire tubing to prevent movement. 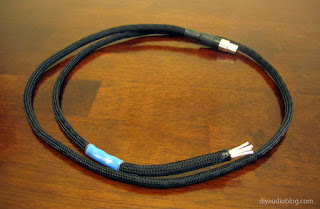 The cable was then sleeved with soft black nylon multifilament. 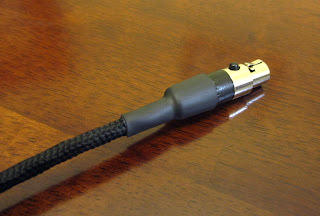 The remaining piece of the jack was filed to allow for the large diameter cable, then slipped over the sleeving and screwed to the metal barrel. A piece of adhesive black heatsrhink was added to act as an additional strain relief and help to keep the sleeving in place. A Switchcraft mini connector could now be installed. You can see more details on a mini connector being installed in this previous post: Silver Plated Copper Mini to RCA Cable. 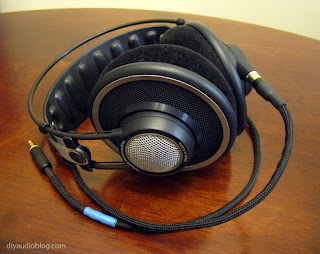 The cable could now be clicked into place on the now repaired AKG K702. The mini connector is inherently non-balanced, but the user can now easily upgrade to a balanced cable when they are ready. UPDATE (6/14/12): The Quincy Jones Q702s are nearly identical, although the internal jack proved to be much more difficult to remove. 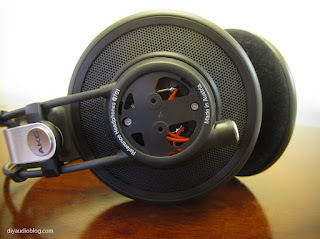 The Q702s below were recabled using Zynsonix Ecs ultra pure ohno cast copper in Teflon. 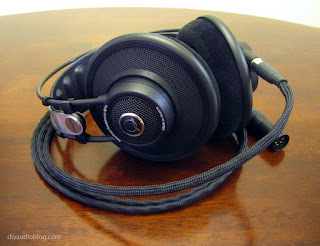 These AKGs feature a fully balanced cable. I hope you found this post entertaining. Please be sure to contact Zynsonix if you'd like to take the music on your headphones to the next level. The above steps detailing the repair and recabling of a headphone are for entertainment purposes only and not to be performed under any circumstances. The owner of this blog and all associated parties can not / will not be held responsible if you attempt the process posted and cause physical harm to yourself, your surroundings or your property. Please keep this in mind.